Are you having neck pain? You are not alone. 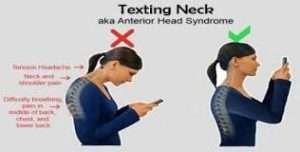 Neck pain from FORWARD HEAD poor posture while texting and sitting at the computer is increasing at an alarming rate. Studies suggest that certain FORWARD HEAD angles can cause as much as 60 lbs of force at your neck. This amount of force over time will strain your muscles, herniate cervical discs, deform bones and even compress nerves causing much pain in your neck and down into your arms / hands. 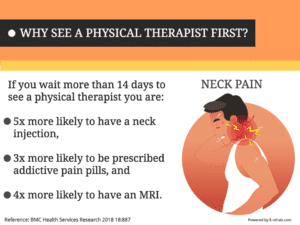 Research indicates if you do have pain, then do not wait! Just like what our forefather Ben Franklin said, “A stitch in time, saves nine”. 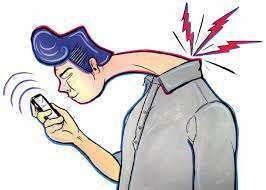 People who do suffer with pain from TEXT NECK should consult a physical therapist ASAP. People who wait longer than 14 days to see a physical therapist are 5x more likely to have a neck injection, 3x more likely to be prescribed addictive pills, and 4x more likely to get an MRI. And all of this could have been avoided just by simply visiting a GOOD physical therapist and healing naturally. When you wait, then you may make the mistake of going down the long pharmaceutical road without relief. So how do we avoid text neck? Obviously do not look down at your phone and bring your phone up to eye level. As far as your computer station set up. Have you eyes level with the top of your monitor. 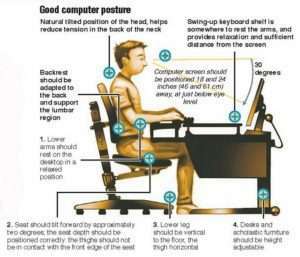 Have your chair support your back enough so your hips are at 90 degrees, knees are at 90 degrees, and arm rests are supporting elbows at 90 degrees, as well as neutral wrists. And the real key is to take breaks. 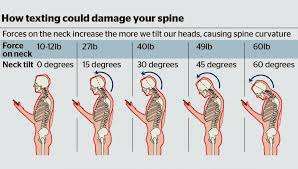 The longer you sit at the computer directly increases your risk for a neck injury. Hope you like these tips on how to avoid Text Neck. Please call us at 802 861 6700 for more helpful tips or visit our website at www.greenmtrehab.com. In "arthritis" , "joint replacement" , "knee pain"
In "arthritis" , "Injury Prevention" , "knee pain"